How to baby proof one's home. 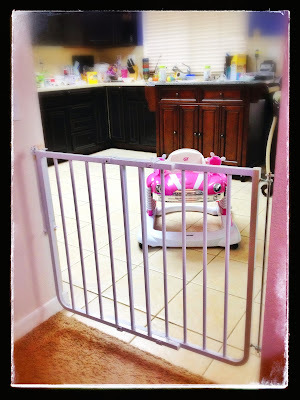 It is rather daunting to think about all the things that are not baby proof in one's home. My baby girl is a little over 8 months old, and she is getting more mobile by the day. My husband and I had been procrastinating about baby proofing our home, and to be honest, knowing that it needed to be done and wasn't, it was really starting to stress me out. And yet, all we both wanted to do after a long day's work was sit on the couch and recharge. So that's why I contacted Robert at Baby Safe Homes. I knew if I waited, we probably would not get around to baby proofing until Kaelani was actually getting into things, and I was not comfortable with that approach. I emailed Baby Safe Homes via their "Contact Us" form on the website. Robert called me back within the hour, and we set up a time for him to come out and assess our home. We communicated mostly via text messaging. I did ask whether he could install some gates I already had. I was pretty disappointed to find out that he could not because the ones we had were not up to safety standards. I was more irritated that Babies R Us would sell such poor quality products and that they would be rated so highly by reviews. Robert explained that most parents rate those products shortly after purchase, and that most of them break down after 30-90 days. I was a little skeptical, but the gates he installed are completely made of metal and seem to be pretty sturdy. He has 5 kids of his own and said he has learned from experience which products are best and which ones his own kids were able to break or figure out. Thankfully, I was able to return our gates (from our registry) and get store credit, so it all worked out. On the day of, Robert arrived a little late to our appointment but he did text me 20 minutes before to let me know he was stuck in traffic. He spent a total of about 2 hours in our home. He would make recommendations and point out possible safety hazards in our home, and then we would decide which items we wanted installed. The cost did add up a little fast, but he was fairly transparent about the total as we went along. Overall, I am happy with the results. He installed a couple gates, door monkeys, power strip covers, and cabinet latches. He was extremely fast and efficient. I know if my husband and I had tried to go out and buy these items and install them ourselves, it would have taken a full day. I did Google the items afterward to see how much mark-up Robert was charging us, and in all honesty, it was not that much. He's a small business owner trying to support his family, so I can understand how the pricing worked out. For our purposes, his services fit the bill. We got a baby proofed home, and we did not have to spend a whole day doing it ourselves. If you are interested in Robert's service, be sure to mention my name and that you found out about his services via my blog. He will give you a discounted installation rate. You basically pay for his labor and the cost of the materials. Do you know of any other baby proofing services in San Diego? If so, please share. I'd love to hear your recommendations.